Speaking of parental authority, we are not talking about spanking a kid or making a child be submissive to his/her elder. NO. We are talking about something more substantial—the way that good parent can discipline and cultivate their children through positive, inspiring communication with mutual respect. In Feng Shui practice, the fact that parents simply run out of their methods of how to guild their children's behavior or habits might be due to the unbalance of energy in the family. Is the back of his/her bed against to the wall in the bedroom? 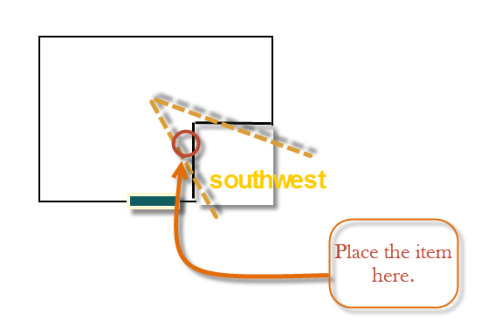 Is the right hand side of his/her bed too close to the wall? Is the bed facing directly to the bedroom door? Take a look at the building outside the kid’s sleeping place. 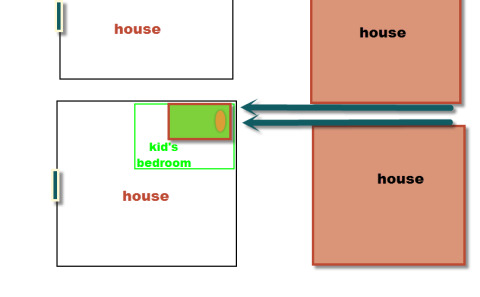 Does it have any cutting edge or house corner pointing right at the kid's bedroom? In terms of feng shui balance, these are all potential factors that can cause a kid’s ill temperament and behavioral problems. You can hang the Four Heavenly King Protection Amulet on the wall to ward off the sharpen Chi that is caused by the corner or the cutting edge. 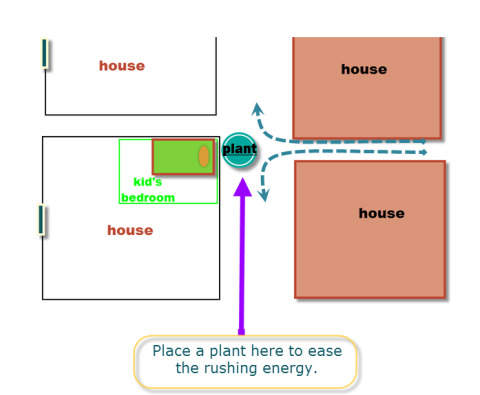 Or, place a plant between the bedroom and cutting edge to ease the flow of rushing energy. You can also take a look at the different corner of your house. 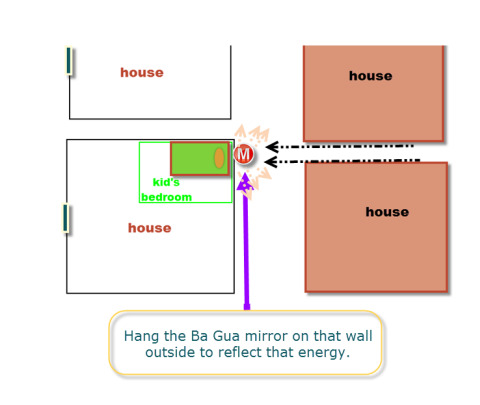 In feng shui bagua, different sectors of house imply the general conditions of the corresponding house members. The east represents the eldest son. The north represents the second son, while the northeast represents the youngest son. The southeast represents the eldest daughter. The south represents the second daughter, while the west represents the youngest daughter. For example, a dirty west corner might affect the health of the youngest daughter in the family. In terms of parent, Kun Gua, the southwest region of Ba Gua, represents mother, hostess of the family. While Qian Gua, the northwest region of Ba gua, represents father, male host of the family. If a house misses these two corner, it suggests that parent in this house is hard to establish their authority. Hence, children would not follow the rules that are given. 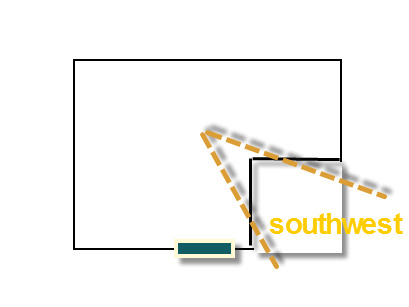 For a house that is missing the southwest corner, place Red Fire Dragon in that area to supply the absent element. For a house that is missing the northwest corner, place Golden Ru Yi with Jade in that area to supply the absent element. Do avoid changing the position of the bed during pregnancy. Avoid shifting homes, renovations, or new constructions during pregnancy. The energy field of a fetus in the womb is extremely delicate, and it would be easily affected by the interruption. 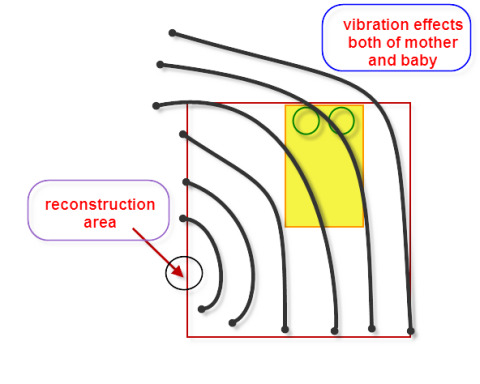 The actions of reconstruction usually generate an enormous amount of vibration. This vibration, functioning as an energy trigger, can affect the fetal development and cause serious results like ectopic pregnancy or miscarriage. To ensure positive feng shui Chi well circulated in the family and lighten up the atmosphere with animated energy, it is very essential to stimulate joyous star # 8 and # 9 to create a happy family feng shui. As the emperor star of current period, Star #8 is most powerful and beneficial star for not only finance, but also every important aspect of life. Its auspicious power will even help to decrease some other ominous stars as well. To boost the energy of Star #8, place one Feng Shui item, such as Red Pyramid in its corresponding position. The future lucky star #9, endowed with most promising blissful power, plays a significant role for those who want to make some advancement in life—from promotion to getting married or conceiving a baby. Star #9 creates immense desirable surprises for the family. To enhance the energy of Star #9, place one Feng Shui item, such as Red Scroll in its corresponding position. Besides the sick star # 2, there are other stars that would also produce harmful effect. Star # 3, the argumentative star, derives from Zhen Gua in the east, and thus has the same manifestation as Zhen Gua. With the name of “thunder” in Ba Gua practice, Zhen Gua produces sudden events - ominous for the Zhen Gua is not in its reign in current fortune period—such like car accident, lawsuit, disagreement, gossips, nervous breakdown, and hyperthyroidism. To suppress the energy of Star #3, place the Feng Shui Fire Ball in its yearly location. Star # 7 derives from Dui Gua in the west; hence it possesses the same attributes as Dui Gua. Since Star #7 is also out of its rule in current period, its manifestations on various aspects of life are unfavorable. Matters in life like robbery, large intestine diseases, respiratory diseases, breaking bones and injuries caused by metals could be all ascribed to ill-developed energy of Dui Gua. To suppress the energy of Star #7, place the one Blue Rhino and Elephant with Water Urn or Blue Rhino and Elephant Plaque in its yearly location. It is OK that sometimes things are unorganized, but it is impermissible to let the place stay dirty. A dirty place is considered a symptom of which your health is going downhill. Avoid staying in the positions of Three Killings, Sui Po and Five Yellow for too long. The name of Three Killings is actually the literal translation from a Chinese Feng Shui terminology "San Sha" which refers to a type of ominous energy expressed in the forms of accident, financial loss and illness. Three killings are brought out by the ill-developed energy from one of the four cardinal directions: North (water), East (wood), South (fire) and West (metal). 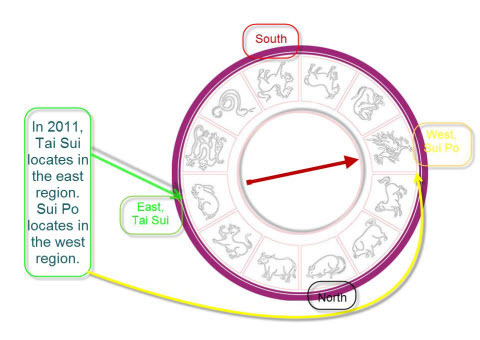 In Feng Shui practice, the twelve Chinese zodiacs that we generally know are referred as earthly branches. These earthly branches, both individually and in combination, represent different types of element. One of strongest zodiac combinations is known as "San He" - trinity of harmony. Each zodiac is in harmony with the other two animals that four zodiacs away from it. For example, the year of 2012 was the year of Dragon. 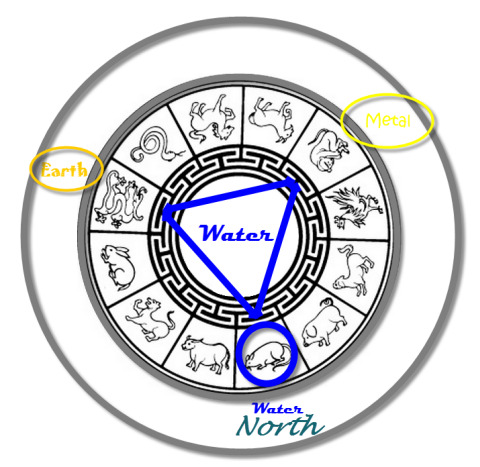 Dragon, Monkey and Rat are in a trinity of harmony, and thus creating a very strong water element due to the leading cardinal water element of Zodiac Rat. Consequently, the north region, where Zodiac Rat resides, will have overwhelming water energy. This type of energy is so strong that it rushes directly to its opposite side, causing turbulence of that corresponding region and even the areas that next to that spot. 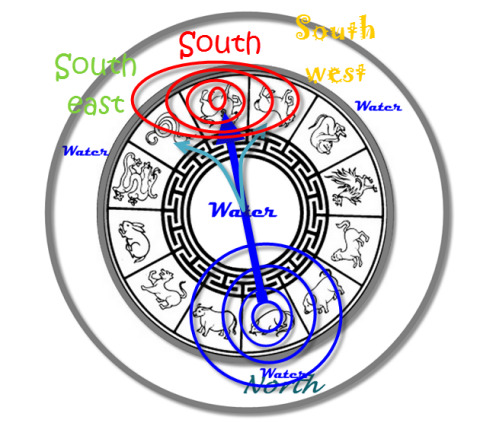 For example, in the year of Zodiac Dragon, the over-developed element, water, is in the north. Hence, the south side is the place Three Killings of the year locates, and fifteen degrees of southeast and fifteen degrees of southwest are also affected. The simply feng shui cure to Three Killings is displaying one set of 3 Divine Guardians in that area. What is Tai Sui and Sui Po? Tai Sui, known as the "The Grand Duke of Jupiter" is the emperor that reigns over the annual energy. According to Chinese astrology, every year is generally composed of two different types of energy: earthly chi and heavenly chi. Earthly chi, generally known as twelve zodiacs, is called earthly branch, while heavenly chi is called heavenly stem. There are twelve types of earthly branches and ten types of heavenly stems. The combinations of earthly branches and heavenly stems create the sixty-year cycle and correspondingly, sixty Tai Suis. For example, the year of 2011 is the year of zodiac Rabbit. The earthly branch is rabbit (Mao is its corresponding Feng Shui terminology), and the heavenly stem is Xin, the ying metal element. However, when applied to practical usage, Tai Sui is usually referred to a region. For example, in the year of 2011, Tai Sui locates in the east region, which is the house of Zodiac Rabbit. The west region, the direct opposite side of Tai Sui, is the area that is under the shadow of Tai Sui. Thus, the west region is called Sui Po, literally meaning that this place is colliding with Tai Sui. The simple feng shui cure to appease Tai Sui is displaying one Tai Sui in that area and carrying Tai Sui Amulet for those who is against or side against Tai Sui. What is Flying Star Five Yellow? Five yellow is the most deadly flying star which possesses the most ominous energy. Its destructive effects can't be underestimated and it brings all kinds of bad luck, disasters, wealth loss and sickness. It is important to keep its effects down before the disasters take place. The location of the flying star five yellow is changed yearly. Don't put water fountain or something that can bring about active energy in this location. Avoid TV set or big red items, too. One 5 Element Pagoda or 5 Element Pagoda with Tree of Life is the most powerful traditional feng shui antidote to cure flying star #5 in Feng Shui. If there is no room for displaying 5 element pagoda, you can hang one Double 5 Element Pagoda Keychain with Tree of Life in the center. See Feng Shui Tips 2015 for details of the flying stars located ( Changed yearly and we update yearly). See more feng shui products for home safety.